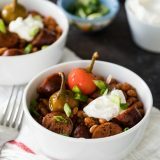 It may be a frugal crock pot meal, but this Crock Pot Beans and Sausage is anything but boring! Dry beans are combined with a from-scratch barbecue sauce and sausages to create at filling and comforting dish. Place the beans in a large bowl and cover with water. Let the beans soak overnight. In the bottom of your slow cooker, whisk together the chicken broth, tomato paste, brown sugar, molasses, mustard, barbecue seasoning, and garlic. Drain the beans, then add them to the slow cooker. Push 2 cloves into each of the onion halves and tuck the onions into the beans. Set the slow cooker to high and cook until the beans are tender, about 6 hours. When there are about 2 hours left, add the sausages to the slow cooker. When the beans are soft, remove the sausages and cut them into 1-inch pieces and return them to the slow cooker. Remove the onion halves and discard. Add the vinegar and Worcestershire sauce and stir to combine. Let the mixture sit in the slow cooker, uncovered, for 15 minutes. To serve, garnish with pickled peppers, sliced green onions and sour cream.